Wedding Speeches and Wedding Toasts – Which Will You Be Giving? 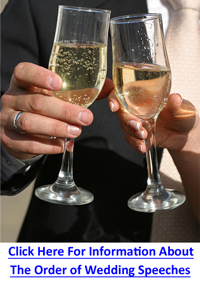 Have you ever wondered what the difference is between wedding speeches and wedding toasts? It’s not unusual to think these two phrases mean the same thing because often they are used interchangeably. And in some cases the distinction does become blurred. But, they’re definitely not the same. And they have key differences – in both substance and length. If the bride and groom ask you to pay a tribute to them – whether as a speech or as a toast – it’s important that you know not only the distinction but also what’s involved in order to save embarrassment in front of the guests. Wedding speeches are a common event at any marriage celebration – not only at the reception but also in pre- and post-wedding events. It’s a time when those who are close to the newlyweds share some of their fondest memories and wish them happiness in their new life together as a married couple. While your tribute should honor both the bride and groom as a couple, in practice your main focus will usually be on one or the other. For example, the father of the bride will talk about his daughter and welcome the groom into his family. The father of the groom, on the other hand, will talk about his son and welcome the bride. In all cases, your tribute should include both the bride and groom. One of the biggest mistakes speakers make when preparing their tribute is to make it too long. Long speeches quickly turn into boring ones unless you’re a talented speaker who can add humor and involve the guests. Generally your presentation should be no longer than 5 minutes from start to finish – including the toast. In many cases, a tribute will include how you met the bride or groom (or both) and, in the case of the parents of the bride and groom, it might also include a story. One of the best introductions I’ve ever read that shows subtle humor is from the father of the bride who introduced the groom by saying he got to know the groom well since his daughter took a long time to get ready for her dates. As a result, he would always have plenty of time to talk to the groom. The father of the bride did express his regret, however, that while he enjoyed these chats with the groom he would have been more grateful had the groom mowed the lawn or washed the father of the bride’s car while he was waiting for the bride to get ready for the date. The length of a tribute is sometimes determined by the agenda. If there are only a few speakers your presentation might be longer – although it doesn’t have to. If there are many speakers, a short tribute is more appropriate – and usually appreciated by the guests. Keep in mind that the true test of an effective speaker is someone who is interesting and leaves the guests wanting more. If you can do that, you know you’ve given an outstanding accolade. Some tributes by their very nature can be – and usually are – longer. A perfect example is the best man speech. The best man’s presentation is always anticipated because it’s usually funny. In many cases it includes humorous anecdotes and remarks about the groom. It’s meant to be good-natured but it’s a delicate balance between that and crossing the line and being embarrassing. Two common ways to give this type of presentation can be equally effective. The first is the traditional way – a straight tribute followed by a toast. While this format is easier to prepare it can be just as effective and just as funny as the second way – which is as a slideshow. The slideshow usually has pictures of the groom (or purportedly of the groom). No matter what your role is, your speech will end with a toast. At this point you ask the guests to raise their glasses and toast the bride and groom. 1. Keep your tribute short unless there are special circumstances that dictate a longer one. Count on 5 minutes as the time limit for making your speech including the toast. 2. Keep your remarks and jokes clean. 3. Refrain from mentioning or alluding to past marriages, divorces, affairs, or relationships. 4. Practice beforehand – preferably in front of someone who can critique your material and delivery. Practice will settle your nerves and give you confidence for the moment when you stand before hundreds of strangers. 5. Choose an appropriate toast that is heartfelt. Then memorize it so you have a polished ending. 6. Don’t embarrass anyone with your remarks. 8. Your presentation should be in keeping with your personality otherwise it will come across as stiff and unnatural. 9. Keep your sentences short and make your subject matter interesting to hold the guests’ interest. 10. Don’t “wing” it. Very few people can give a spontaneous speech – especially in front of hundreds of people – and do an outstanding job. 11. Keep your presentation positive and upbeat. This is a time of celebration and good things to come in the couple’s life. 12. Start preparing early – at least a couple of weeks before the wedding. Too often people leave things to the last minute and end up feeling the pressure of coming up with something that is polished and heartfelt – only to find that their speech and toast are a flop. 13. Keep your presentation focused so it doesn’t drag on. Don’t wander off onto tangents that are inappropriate or irrelevant – it quickly leads to boredom. Don’t Know Where To Start or What To Say? Sitting down to write a speech isn’t easy. You want to do a good job but chances are you don’t know the RIGHT words. Words that convey your sentiments. Words that show your fondness or love and affection for two important people who have joined in marriage. You don’t know appropriate wedding jokes to add humor to your presentation. The easiest and fastest way to get going is to use wedding speech templates. They give you examples to work from. And the RIGHT words to use. These templates and examples are flexible so you can choose what to include and what to leave out. What’s more they can save you a ton of time…not to mention money. And you can weave your own material into them as you get ideas from reading them. Better still, you’ll gain confidence knowing you’ve prepared something that will not only be enjoyed by the guests but will be a true tribute to the bride and groom.